"I got this recipe from a friend in Germany. 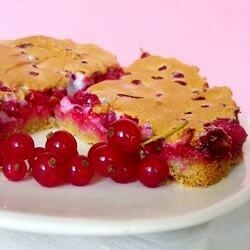 It's a delicious way to incorporate red currants into baking." To Make Dough: In a medium bowl, sift together flour and baking powder. Mix in butter, sugar, egg yolks and lemon zest until mixture forms dough. Let rest in cool place for 30 minutes. Preheat oven to 325 degrees F (165 degrees C). Roll out dough and put into a springform pan. Bake in oven for 25 minutes, or until golden yellow. To Make Filling: In a medium bowl, beat egg whites until stiff. Gradually stir in sugar and cornstarch; beat for 5 minutes. Fold currants into mixture and pour into pie crust. Bake in oven for 10 minutes, or until top is lightly browned. See how to make a delicious, seasonal cranberry dessert. This was a huge disapointment. It was raw berries mixed in meringue. The berries need to be cooked much longer and more sugar should be added. Not much of a pie. This recipe is typical of southern Germany. You must remember that they are talking about FRESH currants, not the dried ones we find in the supermarket. This gets a BEST rating as it is the ONLY useful recipie for red currants that I have ever seen, other than red currant jelly. We have FIVE bushes of red currants and I needed a recipie or two!